There’s plenty about this that a design snob like me could hate. But I can’t help but find that hand-painted lettering impressive. And I think it’s nice to see a garbage truck exude such pride and (questionable?) charm. Thanks to P*S* reader Matt Convente for sending the image. The word "Carting" threw me off. Otherwise, I think it's a nice touch on an industry that is usually relegated to block sans-serif. I also like the yellow/gold frame detail. 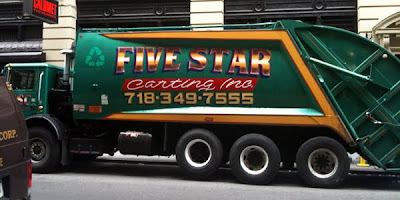 I already feel like I'm getting high-class service - garbage removal for the stars! So sue me, I'm ALWAYS a fan of hand rendered signage. It's old school in a really great way. It's what graphic design USED to be, and unfortunately is a disappearing art. I ran into a scrapbook years ago at a flea market that was a sign crafter's reference book. It was nothing but hundreds of clippings from a magazine called signcraft of hand rendered signs and vehicle graphics just like this one. It's a treasure trove I wish I could share and my most used go-to morgue file piece.